I wrote this in my mind on Thursday, arranged the photos, then must have tried to send it to you by telepathy. You all got it, right? It was our last full day in Yosemite, me, Sister, the Sister-in-Laws, Nephew and Nephew's Girl Friend. 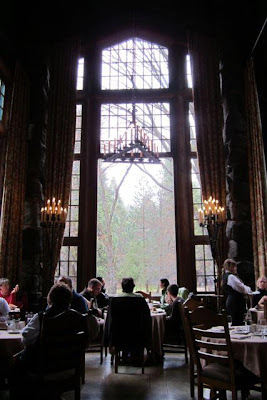 We SILs had breakfast at the Ahwahnee scheduled (but not reserved) and all of us were reserved for a tour of the Ahwahnee. We emerged to a frosty morning, en route to catch the bus to the Ahwahnee. Yosemite Falls had a spray of ice frozen against the valley walls framing its flow. I tromped in amongst the trees where another photographer had found a semi-clear shot. Only he had a big professional camera. 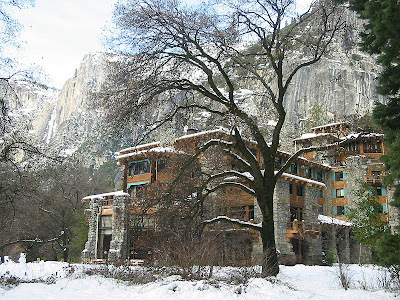 The most direct trip to the Ahwahnee involves changing buses at Yosemite Village. At the transfer point, our driver said the next bus would be along in 8 minutes. The Sister-in-Laws decided to walk. I'm not sure it was all of 8 minutes before the bus actually arrived, but it was crowded and Sister and I stood near the driver and she opened her window as we passed the SILs and hollered and waved at them. They didn't actually see us, just the driver, but they arrived pretty quickly. Breakfast in the Dining Room. We were at the table in the middle of the alcove. Sister and I had my favorite, the blueberry pancakes, with juicy warm blueberries outnumbering pancake batter by a long shot. The SILs had the Eggs Benedict. Yum! We intended that breakfast carry us through the 12:50 Ahwahnee tour. It surely would. Sister and I read (and snoozed) for the interval on the mezzanine overlooking the Great Lounge, while the SILs disappeared to do sightseeing and walking, then all gathered at the appointed time, adding Nephew and Nephew's GF to the tour group. The tour started on the exterior of the hotel. Here's a photo from Wikipedia with a view from quite near where we assembled, differing only that it didn't snow this much until Friday. molded concrete, to protect against one of the major threats in the area, fire. Sister-in-Law appears to be snoozing, but she always manages to blink when I take her picture! Stephen Mather, a well-to-do lover of the outdoors, disgusted by the miserable conditions of the national parks in the early 20th century, complained to the Secretary of the Interior, who promptly invited Mather to Washington to do something about it. Mather did. One of his plans for bringing money to Yosemite was to build a grand hotel that would attract the rich. Thus began the planning and building of a destination hotel, sited with spectacular views of the landmarks of Yosemite. 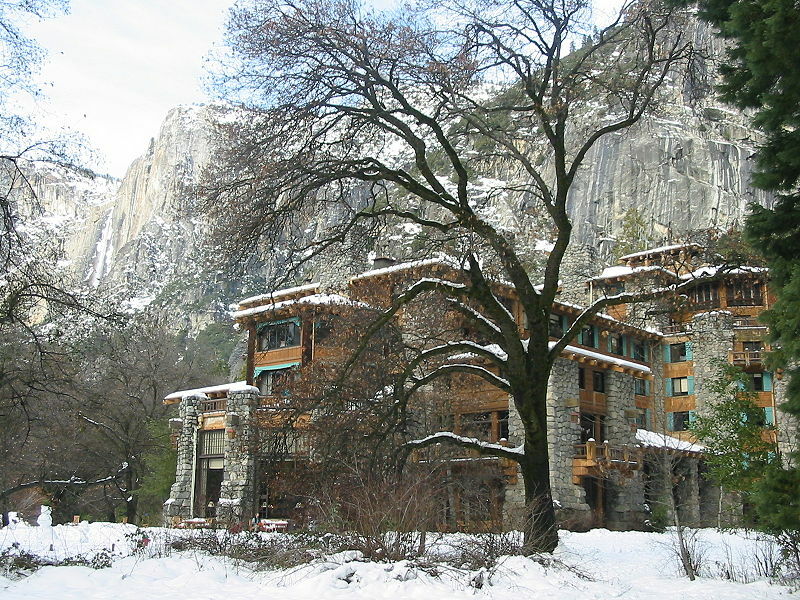 The Ahwahnee Hotel opened in 1927. 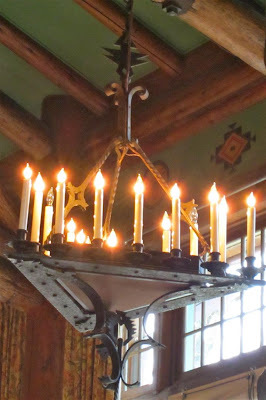 The theme is kind of a grand, eclectic mix of rustic lodge, Native American design, and European design and craftsmanship. Fortunately, one hunting lodge plan to mount bison heads on the walls went by the wayside. All the light fixtures, for example, were designed and hand-crafted to the theme. This chandelier, for example, is in the lobby, just inside the entrance. Inside, we went to the lounge area outside the Dining Room. Since luncheon service was still being provided, our group went in a few at a time to take pictures. Since we'd eaten in there that morning and the day before, I provided you above with our breakfast picture, and the big overview I took Wednesday at lunch. The guide also described the Bracebridge Dinner, which has been held in the Christmas season since 1927. Ansel Adams, remembered now more for his photography, was the original creator and musical director. Photography was his "day job" that allowed him to indulge his musical passion. Stained glass panels were placed at the tops of the ceiling-high windows, not because someone thought that was a good idea from the start, but because the view of the underside of the structure holding the upper floors was not attractive. If I read the information correctly, these fire escape stairs were added in later remodels. I think they have an interesting beauty to them, although I sure wouldn't want to have to come down them from the upper floors. Let me tell you about the time the fire alarm went off in the middle of the night in the Ahwahnee during a stay a couple of years ago! But not now. The ranger guide provided us with many interesting tidbits, not only about design and financing and building, but about other uses of the hotel, such as use as a military hospital during World War II, or changes made once Prohibition was over, or even last minute changes in the configuration of the entry on opening day. Reservations are required for the tour. 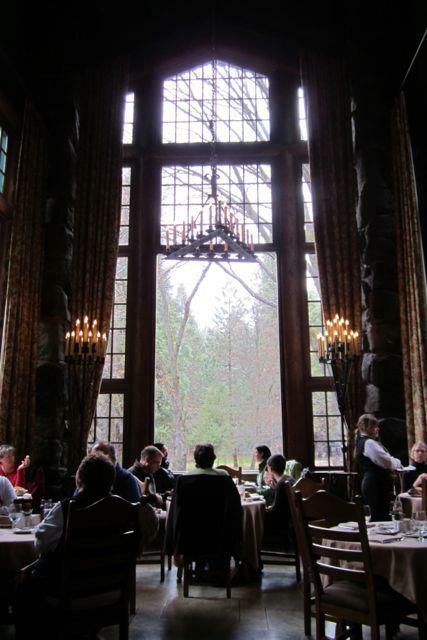 When you make your grand trip to Yosemite, stop at the concierge desk at the Ahwahnee to sign up. If you haven't been here yet, you will make your grand trip, won't you? It -- Yosemite -- is the reason I live where I live. What a beautiful hotel and your photos do it justice! Sounds like you had a few frosty days. Hope you were able to stay nice and warm. I'm down with the pancakes. Good choice and the view from the dinning room is simply marvelous! Had the clouds not been hovering low, we would have been able to see Yosemite Falls from the window. We were prepared for the cold. See my next post -- when I get to it! Sounds positively divine. And the hotel is beautiful. You have caused me to put Yosemite on the list!